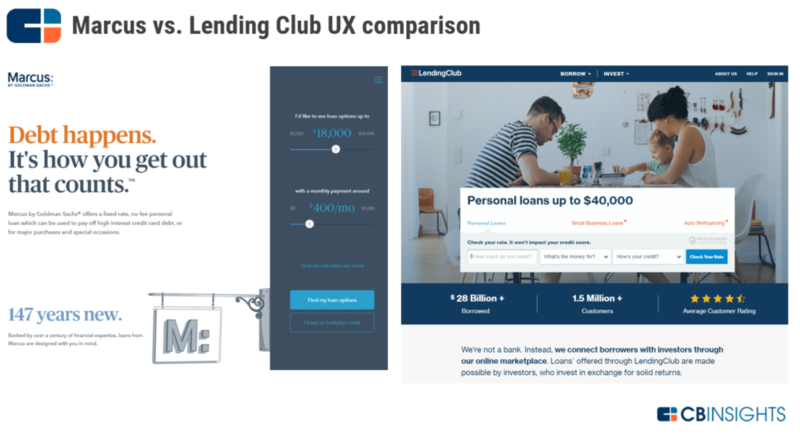 Goldman Sachs Strategy Teardown: Goldman Attacks Lending Club & Prosper, Courts Main StreetAs its bond trading revenue plummets, Goldman has undergone a major strategic shift, looking to grow the revenue opportunity from its consumer digital finance operation. We analyze how this shift is playing out in its hiring, investments, M&A, and product development. As its bond trading revenue plummets, Goldman has undergone a major strategic shift, looking to grow the revenue opportunity from its consumer digital finance operation. We analyze how this shift is playing out in its hiring, investments, M&A, and product development. In 1869, former shopkeeper Marcus Goldman launched a new business trading in commercial paper. In other words, Goldman helped small businesses secure short-term capital by connecting those entrepreneurs with investors. Today, that business is The Goldman Sachs Group, a $90B multinational finance company engaged in investment banking, investment management, investing & lending, equities trading, and fixed income, currencies, and commodities (FICC) trading. In the first half of 2017, the mix of those five businesses was responsible for $15.9B in net revenues. Goldman Sachs has changed a lot through its 148-year history. But as technology continues to roll through the financial services industry, Goldman is one of the few bulge bracket banks today that is staking its reputation and future on new strategic bets in digital finance. Download the PDF to explore Goldman’s investment and M&A history, patents, forward-looking moves, and more. Eight years after Matt Taibbi famously called Goldman Sachs “a great vampire squid wrapped around the face of humanity” in Rolling Stone, perspectives are mixed on the future of Goldman Sachs’ consumer-facing fintech initiatives. 46% of Goldman Sachs job postings are in technology. Based on Goldman’s hiring activity, mobile consumer banking apps look to be next for the company’s Digital Finance offerings as it actively seeks mobile developers. Goldman Sachs’ online lending arm Marcus lent $1 billion in the first 8 months of operation. Now it is taking its digital finance brands global. After taking on Lending Club and Prosper in the US, Zopa and Ratesetter look to be next. Goldman plans to launch its Marcus brand in the UK by the middle of 2018 and is actively hiring product managers, communications, and customer support personnel for its Digital Finance subdivision in London. Goldman Sachs is one of the top two most active US bulge bracket banks investing in fintech startups. These investments come out of different groups, including merchant banking and principal strategic investments, but have also gone to a broad array of categories, including marketplace lending, mobile payments, fintech infrastructure, and commercial real estate investing platforms. Goldman has pushed investments into Brazil. Goldman is betting on Brazil’s economic and political situation to improve, with bets on fintech providers, self-storage companies, and logistics startups. Goldman’s cryptocurrency patent made headlines, but most of its patents have focused on improving its systems. Recent patent activity has focused on internal systems, including managing compliance and regulatory risk, structured data distribution, and cyber risk. Recent attention has heavily focused on the poor performance of the latter. Traditionally a profit machine, Goldman’s bond trading unit saw net revenues fall to $7.6B in 2016 from from $23.3B in 2009. In Q2’17, Goldman’s FICC client execution unit saw its revenues drop 40% on a year-over-year basis and 31% lower than Q1’17. 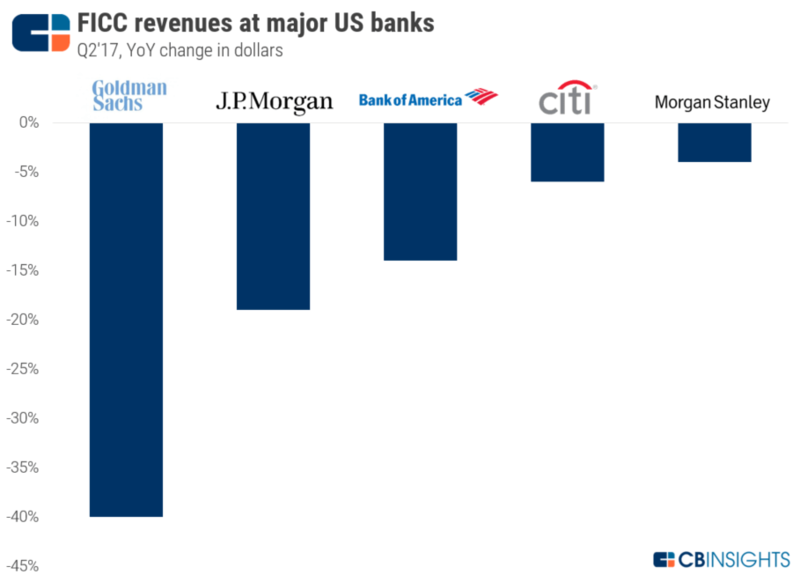 While other major banks have also been hit by the FICC slowdown, some saw significantly smaller declines In Q2’17 such as Citigroup (6% drop YoY) and Morgan Stanley (4% drop YoY). In a presentation at Barclays Financial Services Conference in September 2017, Goldman President and Co-Chief Operating Officer Harvey M. Schwartz attributed the decline in FICC revenue to both macroeconomic external factors (including interest rates and regulation) and specific ones (51% of FICC sales in the first half of 2017 were by hedge funds and active asset managers). 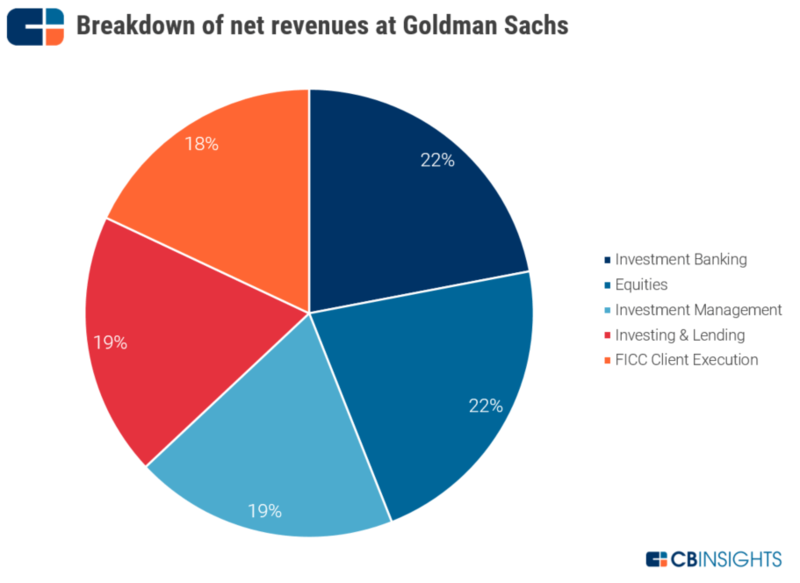 Goldman’s stated plan to address FICC challenges is to deepen its penetration with asset managers and banks, attract new talent, and strengthen its corporate offering. Over the next three years, Goldman believes doing these three things can result in $950M+ in additional net revenue. Meanwhile, Goldman’s investment banking division saw an 11% drop in revenue last year. In order to broaden its relationships, Goldman has strategically shifted some of its key investment banking personnel to cities outside of core markets, including to Atlanta, Dallas, Seattle, and Toronto. In his Barclays presentation, Schwartz further explained that Goldman would be “leveraging technology to efficiently scale the delivery of our products and services to our clients.” In June 2017, Goldman made headlines for the work it’s done mapping out the initial public offering into 127 steps and finding ways to automate parts of the process. An interface Goldman has built, Deal Link, is now replacing informal checklists and tracking legal and compliance reviews associated with IPOs. Deposits have grown significantly as a source of funding at Goldman Sachs. In Q1’17, Goldman’s deposit base grew to $127.9B (versus $82.9B in 2014). Goldman entered the consumer deposit market last year after closing its acquisition of GE Capital Bank’s online deposit platform and assumed $16B of deposits, $8B of which were online retail savings accounts. Goldman’s GS Bank had increased its online deposits from individuals to over $12B by June 2017. Notably, Goldman seems to believe that its digital consumer lending and deposit platform has as large of a net revenue growth opportunity as its FICC trading unit. This is a remarkable shift in strategy that only materialized in the last three years, and the strategy is still in the extremely early innings of its growth potential for Goldman. In October 2016, Goldman formally launched its retail online lending business, Marcus, marking its first move into the consumer lending space. Backed by the funding advantage of Goldman’s balance sheet, Marcus launched and still operates with a single, customizable personal loan product for Prime borrowers (660 credit score and above): up to $30,000 with the promise of no fees and straightforward terms. Marcus is led by Harit Talwar, who brings consumer finance experience as former president of US Cards for Discover Financial and now serves as Goldman’s Head of Digital Finance, where he oversees the online lending and deposit businesses. While Marcus initially acquired customers by direct mail, it has since expanded into the aggregator channel, including Credit Karma and LendingTree, and direct online customer acquisition. 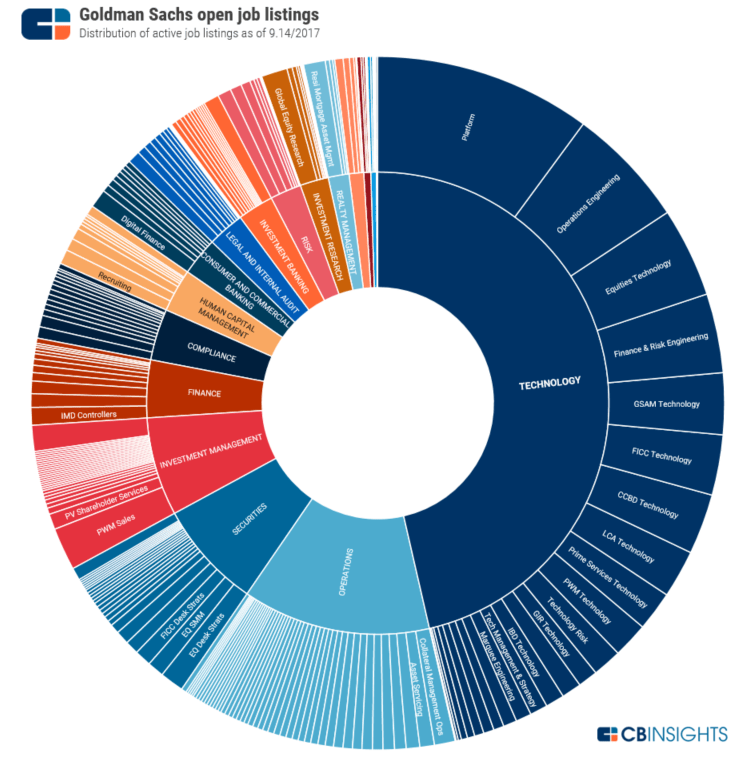 An analysis of Goldman’s 2,000+ open job listings by division and business unit confirm its focus on technology and digital finance. As of 9/14/2017, 46% of all of Goldman’s jobs were in its technology division. The highest percentage of technology jobs were for platform roles, followed by operations engineering and equities technology positions. 6% of all technology jobs at Goldman Sachs were in its Consumer and Commercial Banking business unit, which houses its Digital Finance subdivision. Goldman is actively hiring Android developers to enable the creation of its “all digital retail bank.” Earlier job postings focused on hiring iOS developers. This hints that Goldman’s Digital Finance (GS Bank, Marcus) product offerings may soon include native mobile apps. Goldman is bulking up hiring for its Digital Finance unit in the UK. London-based roles in the company’s Digital Finance subdivision include communications, customer support, product management, and DevOps. Goldman is also making a number of engineering hires for its Marquee platform, which provides clients access to its analytics, trading, and data tools. 15+ engineering jobs in New York or India are for developer roles related to Marquee engineering. The hiring comes as Goldman is now looking to monetize some of its software as well. Goldman is also reportedly seeking investments to spin out its web app Simon, which allows brokers to buy and adjust structured note products, at a valuation of around $75M. GS Growth — Goldman Sachs makes growth-stage investments into software, technology-enabled business services, and healthcare IT companies of $25M or more out of a group within its Merchant Banking division. Goldman Sachs Investment Partners — GSIP’s venture capital and growth equity group has invested in a number of consumer-facing or B2B2C tech companies globally, including Uber, Facebook, Pinterest, Spotify, thredUP, foodpanda, GoEuro, and Compass. Goldman was a co-lead investor in Uber’s Series B round in December 2011, when the ride-hailing company achieved a $316M valuation. Goldman Sachs Private Capital Investing — Within Goldman Sachs’ special situations group, Goldman Sachs Private Capital provides “long-term capital to growth and middle-market companies” investing “$20 to $150 million per transaction in the form of common, preferred and structured equity.” Goldman’s recent $153M debt and equity financing to British consumer lender Neyber was made out of its private capital unit. Principal Strategic Investments — Goldman makes long-term strategic investments into fintech, enterprise, and/or market infrastructure companies where it plans to use the technology internally or develop a business relationship. This includes an investment in over-the-counter derivatives trading systems vendor Droit Fintech. 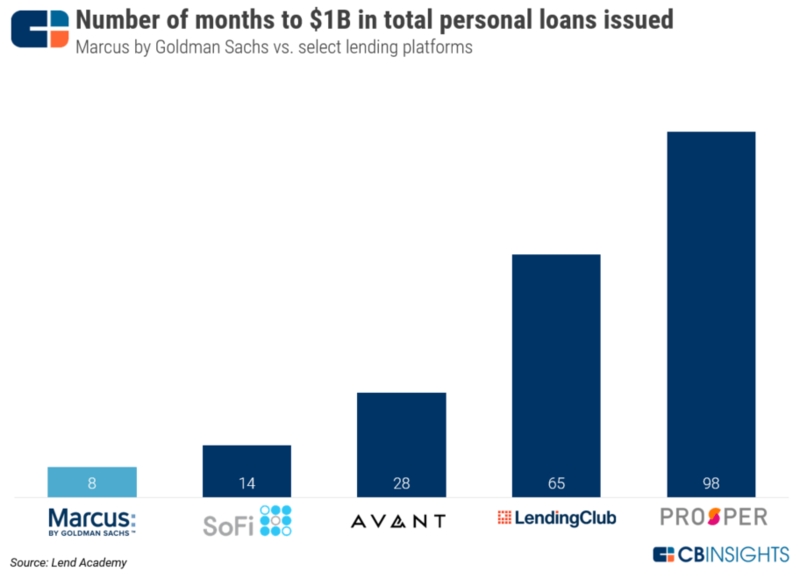 Lending — Goldman also provides lines of credit to technology companies including Dropbox, Stripe, MediaMath, and fin tech companies including Nubank, Fundation, and, prior to its IPO, OnDeck Capital. 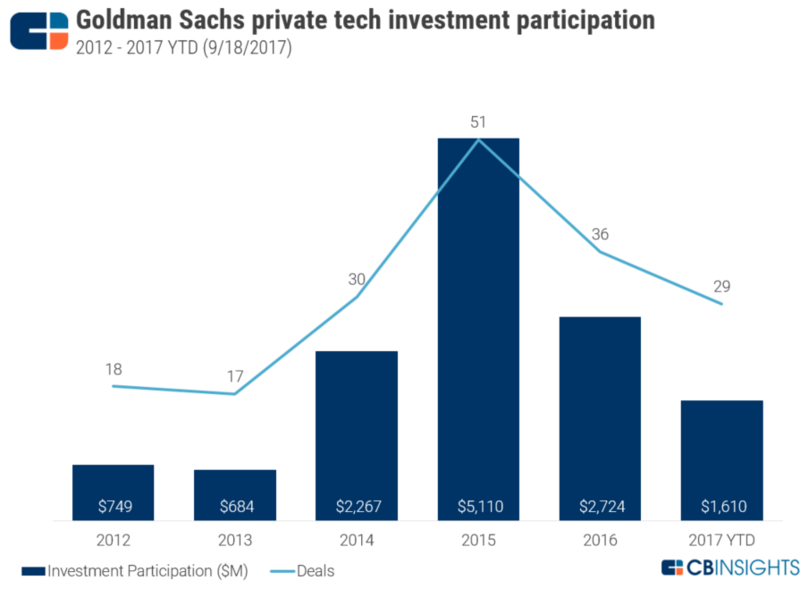 The chart below shows Goldman’s participation in new and follow-on, enterprise and consumer, private tech investments over the last five years. Of note, Goldman’s equity investments to private tech companies fell 29% YoY in 2016. Goldman participated in over $5B of tech investment in 2015 including mega-deals to Uber, Spotify, and, in China, Guahao and iTutor Group. New private tech investments in 2017 YTD by Goldman Sachs include enterprise storage company Nasuni, enterprise database startup Redis Labs, and cloud computing vendor Skytap. More recently, an analysis of Goldman’s investments show it has made a handful of bets in Brazil. Last July, Goldman’s Private Capital group led a $10M investment in Brazilian trucking marketplace startup CargoX. In the same month, Goldman invested $184M in Metrofit, a joint venture that owns self-storage sites in Brazil. Want the full expert post? 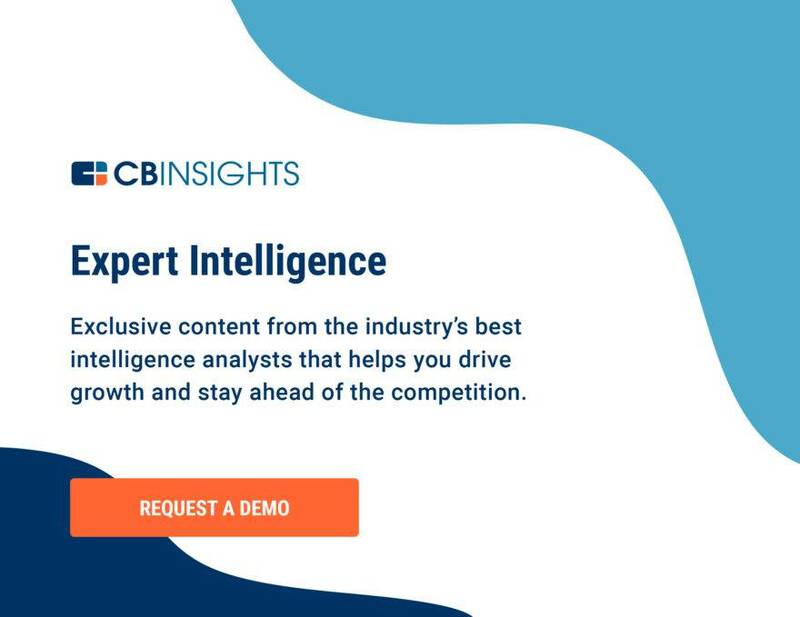 Become a CB Insights customer. If you’re already a customer, login here. Southeast Asia Is Historically Underbanked. Fintechs Are Finally Seizing The Opportunity.